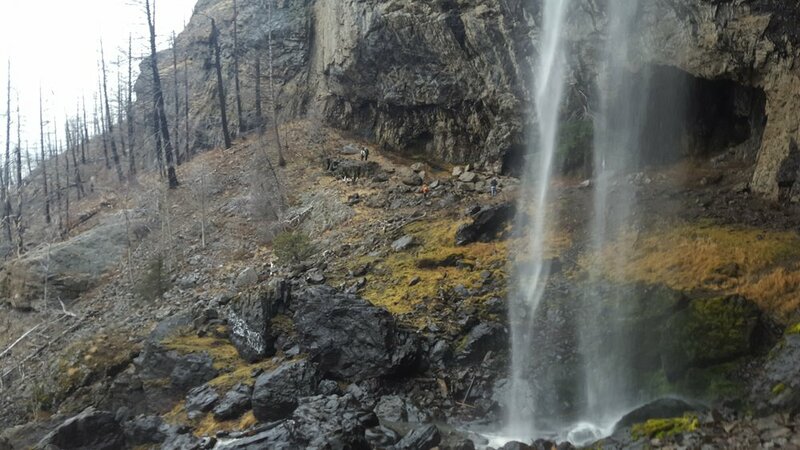 Christie Falls is one of our all-time favourite hikes in the Okanagan. After a quick drive, less than an hour from downtown Kelowna, you can find yourself at the trailhead. This is a mostly inverted hike, meaning that the route there is primarily downhill. You'll be walking through some incredible landscapes left from the 2009 Terrace Mountain forest fire. The area is still in recovery but we see more of the natural wildlife returning each year. 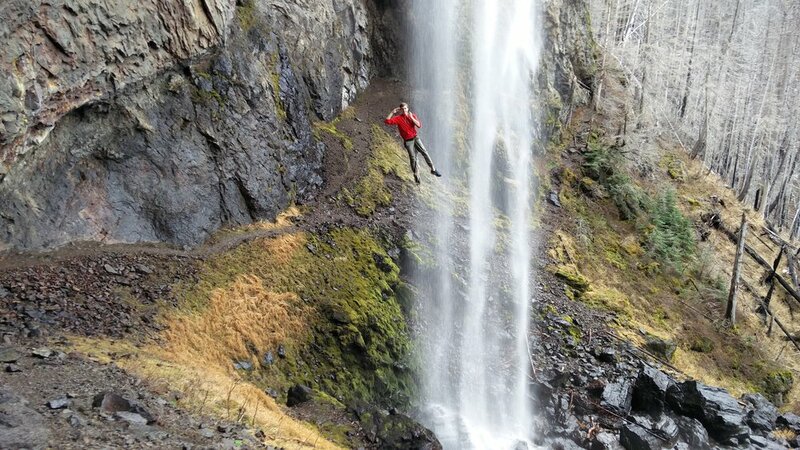 The hike features a steep rope-assisted descent near the waterfall, a stunning cliff face, small cave, and even a rope swing into the waterfall. All this comes together to create one of the coolest places to explore in the Okanagan! This trail may not be accessible until late-April / early-June due to high elevation. You are likely to run into snow on the road until late in the season. This being said, depending on the weather, we have previously been able to access the trail as late as mid-November without any snow. There is a rope swing under the waterfall, but it is to be used at your own discretion. The rope is left up year-round so its condition varies. Proceed with caution. This hike is an hour drive from downtown Kelowna. Coming from Kelowna drive over the bridge towards West Kelowna. Take a right at the overpass onto Westside Rd. Continue 8.4km then turn left onto Bear Lake Main Rd. Continue 12km then take a right at the fork. Continue 10.7km along the gravel road then turn right onto Terrace Mountain rd. at the far side of Big Horn Lake. Drive 3.6km up this road then turn left. Finally follow this road 2.7km to the parking area where you will see the trailhead. Did you enjoy one of our hikes? Don't forget to tag @officialbearlives in your photos for a chance to be featured! Disclaimer: bearlives.ca is a Kelowna hiking information site. While all information is accurate to our experiences, terrain and other factors can change season to season. Please be prepared for each hiking trail; do not put yourself in a dangerous situation. Always tell someone you trust where you are going. bearlives.ca does not accept any liability for injuries or loss on hikes recommended by this site. Be safe, and be bear aware.